Supreme Court Judges’ Retreat: Is the criticism that those critical of the Government must also have been invited valid? The 4th Retreat of the Supreme Court Judges at the campus of the National Judicial Academy, Bhopal, which concludes today, has drawn criticism that Judges are being exposed to only one school of thought on national security issues, and that the views of human rights defenders have been denied a platform before the Judges. Thus while National Security Advisor, Ajit Doval, spoke at the Retreat defending the Government’s stance on national security issues, human rights lawyers who are critical of the national security concerns of the Government were not invited to the Retreat. LiveLaw has found that during the third Retreat in 2009, Arun Jaitley, who was the Opposition Leader at that time, was invited to speak at the Retreat, along with the then Union Minister, Salman Khurshid and the senior advocate, K Parasaran. This shows that in the past, the National Judicial Academy, which sponsors the Retreat on behalf of the Supreme Court, and which is fully funded by the Central Government, took care to ensure that the guest participants came from diverse political and social backgrounds, to address the Supreme Court Judges. If the past two Retreats are any indication, the Judges of the Supreme Court, did get an opportunity to interact and benefit from a cross-section of views, presented by guest participants. In this brain-storming exercise (the right word here is chintan baithak rather than pathashala, as a newspaper called it), the Judges look for diversity of views on major issues, so that they get exposed to the diversity outside the court room. This sort of diversity of views helps the Judges to get the much-needed insights on certain issues, which may not be possible, while listening to the arguing counsel in the cases which come before them. Livelaw, therefore, accessed details regarding the second and third Retreats of Supreme Court Judges held in 2007 and 2009. The details of the first Retreat, held in 2005, are not readily available. The details of the third Retreat were obtained from the Annual Report of the NJA, for that year, while those of the second Retreat were collected from the Supreme Court’s Court News for that year. The second Retreat was held at the NJA’s campus in Bhopal from December 16-19, 2007. The purpose of the retreat was to provide Judges an opportunity to discuss mutually, and with policy makers and analysts, key challenges facing our country in the emerging global scenario most relevant to strengthening the administration of justice. The main focus of the retreat was on “strengthening the administration of justice in India in the emerging global scenario”. The retreat dealt with three broad themes: A. Challenges facing India in the emerging global and national scenario and its implications for the administration of justice; B.recent developments in foreign and international law; C. in the light of the above, the challenges facing the administration of justice in India. The former President of India, late APJ Abdul Kalam, made a presentation before the Judges on “Envisioning the Future”. The retreat also considered how judicial institutions and the law are being shaped in other countries in response to similar global forces that are impacting India. Justice Stephen G Breyer, Judge of the Supreme Court of the USA, participated in the event. He discussed the development of US public law in response to globalization. Speaking through a video-conferencing link, Prof Paul Craig, Professor of Law, University of Oxford, and one of the leading experts in public law in UK, discussed developments in public law in the UK. Professor M Sornarajah, Professor of International Law at the National University of Singapore and the University of Dundee, a leading third world voice in international law, spoke about the latest trends in the development of international law. Special attention was given in this regard to criminal justice administration (given that over 70 per cent of India’s pendency consists of criminal cases); and the impact of WTO on domestic law and judicial reform initiatives of the judiciary to strengthen India’s judicial system. Retreat offered a systematic academic dialogue between the Judges and some of the leading minds of the country and the world. It showed the keen interest of the judiciary in remaining upto date with latest academic and policy perspectives on all key issues of concern to courts. The retreat gave a valuable insight to contemporary thinking on the new challenges facing the country and the administration of justice. Winter Retreat” of the Judges of the Supreme Court of India, was held at Vigyan Bhawan, New Delhi. The main objective of the programme was to reflect on the key social, economic and political forces shaping the nature of adjudication in Indian courts in the then global and national scenario, and to discuss the challenges facing the judicial system as a consequence. 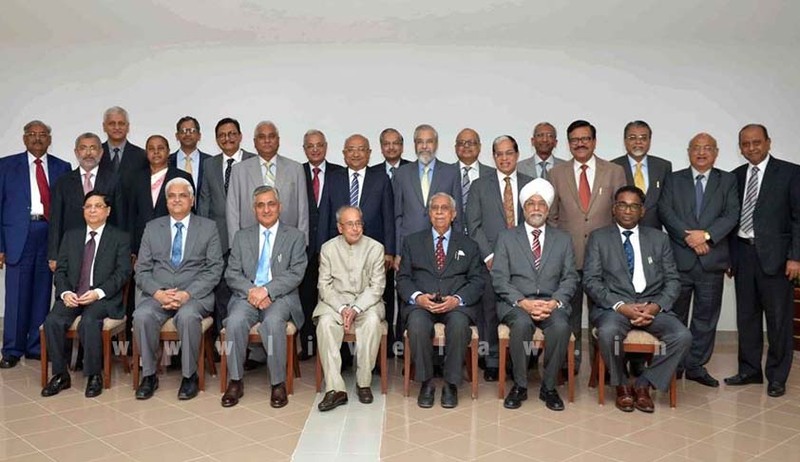 The session featured an inaugural address by the Vice President of India, M.H.Ansari and keynote address by the then Chief Justice of India, Justice KG Balakrishnan. This was followed by presentations on the international financial crisis by Montek Singh Alhuwalia and Prof.Prabhat Patnaik. Discussions then turned to criminal justice administration, particularly in the context of terrorism. Prof David Gole, Georgetown University, USA, made a presentation on the US experience with terrorism and the approach adopted by the US Supreme Court to this issue. Public expectations from the judiciary in responding to these challenges were another aspect of the deliberations. Eminent advocates, Arun Jaitley, Salman Khurshid and K Parasaran presented various views on this issue. In light of these challenges and expectations, the deliberations focused on the means to strengthen the judicial system so as to provide an effective response to these concerns. The then Union Law Minister, HR Bharadwaj made a presentation on the role of the government in strengthening judicial infrastructure and support systems to enable the judicial system to meet current and emerging challenges. The answer to the question posed in the headline, in the context of the previous Retreats, therefore, has to be yes.